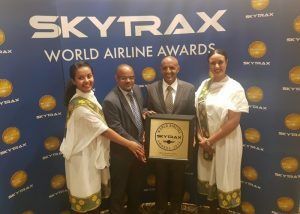 Addis Ababa (Ethiopia) – July 24, 2018 (travelindex) – Ethiopian Airlines, the largest Aviation Group in Africa and SKYTRAX certified Four Star Global Airline, is pleased to announce that it has won SKYTRAX World Airline Award for the Best Airline in Africa for second successive year. Skytrax is the most respected global air transport rating organization that conducts the world’s largest annual airline passenger satisfaction survey where customers make their own personal choices as to which airline they consider to be the best. Ethiopian Airlines is a multi-award winning airline and has previously received SKYTRAX World Airline Award for Best Airline Staff in Africa, two times. Ethiopian commands the lion’s share of the pan-African passenger and cargo network operating the youngest and most modern fleet to more than 110 international passenger and cargo destinations across five continents. Ethiopian fleet includes ultra-modern and environmentally friendly aircraft such as Airbus A350, Boeing 787-8, Boeing 787-9, Boeing 777-300ER, Boeing 777-200LR, Boeing 777-200 Freighter, Bombardier Q-400 double cabin with an average fleet age of five years. In fact, Ethiopian is the first airline in Africa to own and operate these aircraft.